Since 1981, Alderwood Landscaping has shown an uncompromising commitment to a higher quality of life for its clients. Our landscape architects create fully functional spaces that include landscaping, patios/pavers, fire pits, water features, and sport courts. We specialize in Backyard Resort creations, managing the project through design and construction. We recommend visiting our website to look at our projects before contacting us at <a rel="nofollow" target="_blank" href="https://alderwoodlandscaping.com">https://alderwoodlandscaping.com</a>. *Please note we do not do repair work, maintenance, or small one-piece jobs - we are a design build firm. * We have gone to great lengths to acquire the best professional Landscape Architects and the most experienced construction crews in the region. We have created an approach to landscaping that has positioned our company to work on some of the most involved and demanding design projects around. You will find us anything but traditional. Alderwood Landscaping will work with you to blend creative ideas and design innovation with the beauty of your natural surroundings. Together we can create an environment you will truly call your own. It's your world, let us create your paradise. "I couldn't be happier with having chosen SCJ Studio for my landscape design." Our clients love working with us, you will too. We are a small group of thoughtful designers led by landscape architect Mark S. Garff. SCJ Studio specializes in residential gardens and site planning, as well as public and urban spaces, parks, ecological restoration, and navigating tough permitting requirements. We are strategic thinkers and enjoy challenging work. We are team players, and understand the complex environment in which we do our work, as our experience in Washington runs deep. Our landscape architecture-focused office is in Seattle, but is part of a larger group of talented engineers, planners, biologists and designers at SCJ Alliance. With locations in Wenatchee, Lacey, Centralia, and Vancouver, we are community-focused - listening to our clients, taking their vision to bring to life design solutions that exceed expectations, are site-sensitive and appropriate, and match the project constraints. Father Nature Landscapes of Tacoma, Inc.
***Please see erinlaudesign.com for complete description of Services*** Contemporary, Modern, Lush, Sustainable and Edible Landscape Design for residences & commercial properties in Seattle, WA. Certified Professional Horticulturalist (CPH) and Permaculture Certified. Hayes Landscape Design offers a range of services, from design of residential gardens, parks and light commercial projects. Margaret provides site planning and design, grading and drainage analysis, planting design and garden "coaching". Margaret is experienced in designing and detailing site improvements including arbors, fences, paving, water features, seasonal color design, and preparing design through construction drawings and cost estimates. She approaches each project with attentive care and works with clients to achieve their design goals keeping their own styles and budgets in mind. Landscape designer Tish Treherne is best known for creating stylistically unique gardens that are functional and enduring. Taking design direction from architecture and the surrounding landscape, she works in both traditional and contemporary styles. Partnerships with a team of top notch contractors and craftspeople ensure the attention to detail that Bliss gardens are known for. Bliss has been featured in Sunset Magazine, the Sunset Western Garden Book, the Sunset Western Garden Book of Landscaping, The Sunset Western Garden Book of Easy-Care Plantings, West Sound Home and Garden, Northwest Home, Seattle Times Pacific Northwest Magazine and on Sunset.com. Our Mission Our hope is to provide spiritual and mental growth, professional learning, and skill building for every employee at our company. We want each individual who comes into our environment to be inspired and, when the time comes, leave with additional knowledge they gained during their time with us. We are committed to helping people create their story, and an emotional connection between life and land. The Father Nature Team relies on each other heavily in order for this process to take place. Our lives evolve each day, but we will stay true to ourselves, our mission, and our story. All while working toward the ultimate goal of helping each of our clients redefine how they experience outdoor living. Who We Are Integrity: doing what is right when no one is watching Passion: loving life, people, what we do Growth: spiritual, personal, professional, relational Team: leveraging our talents to maximize potential Serve: giving back to our clients, teammates, and community Value: through quality, creativity, and sustainability Significance: leaving an impression on the land and lives encountered Design Consultation We visit your property and dream with you. We’ll discuss your design and outdoor living goals, then follow up with a landscape design, if you opt to use our design services. * Proposal & Contract With a design agreed upon, we’ll present a comprehensive proposal for landscape construction. If you want to proceed, a contract will be signed and first payment given. Build, Plant & Install We create the yard of your dreams, providing amazing service, proactive project management, and clear communication throughout the landscape construction process. Final Walk Through We walk you through the amazing work that has been completed for you, correct anything that doesn’t meet agreed upon expectations, and collect your final payment. 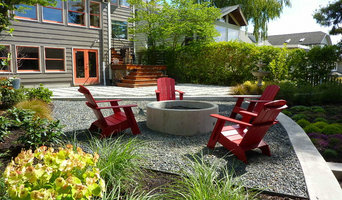 Snoqualmie Design LLC offers full landscape design and project management services in Seattle and Eastside communities. Owner Andrea Williamson has worked in residential landscape design since 2006, both independently and for design/build contractors specializing in residential installations. Her clients have had varied sizes of landscapes in many premier areas including Medina, Clyde Hill, Redmond, Woodinville, Snoqualmie, Kirkland, Queen Anne, Sammamish, North Bend, Kenmore, Issaquah and Lake Forest Park. With a background in Fine Arts as well as Construction, Andrea approaches each project with a focus on beauty and function. This balance of creating usable outdoor spaces that satisfy a pleasing aesthetic has earned her compliments from both home owners and contractors who appreciate Andrea's involvement in the installation process. Andrea has Bachelor degrees in both Fine Arts and Business from the University of Oregon. She has an Associates degree in Landscape Design & Construction from South Seattle Community College. Additionally she has earned a Low Impact Development Certificate from Washington State University's Extension Program and has taken many Landscape Architecture classes at the University of Washington. Andrea has worked for several quality construction companies including Sander Groves Landscaping, Classic Nursery and Landscaping, May Creek Landscaping and J & R Rockscapes. Since 1983, Lankford Associates Landscape Architects has been practicing Landscape Architecture and garden design throughout the Pacific Northwest region, We specialize in residential master plans, commercial and multi use projects. We tie the architecture and gardens together, bringing the landscape into the built spaces and carrying the architectural elements into the landscape. Our designs emphasize low maintenance, sustainability and timeless design, emphasizing what is good within each unique site. "We couldn't be more pleased!" Our clients love working with us, you will too. We are a small group of thoughtful designers led by landscape architect Mark S. Garff. We specialize in detailed residential gardens both large and small, shorelines, ecological restoration, native and drought tolerant plants. We are fun to work with, flexible and enjoy designing both modern and traditional gardens. I am an APLD Certified Landscape Designer and a registered Architect. Banyon Tree Design Studio creates custom landscape design and architecture for discerning homeowners and individuals wishing to create beauty, function, and joy in their home and gardens. 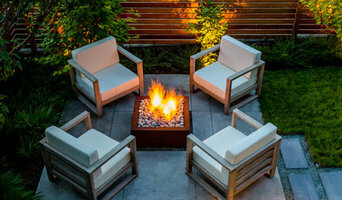 Olander Garden Design is a Seattle-based landscape design business focused on creating innovative outdoor spaces that find the intersection between timeless and contemporary, modern and organic. Designs reflect the home-owner’s lifestyle, interest and aesthetics, all while maintaining a healthy environment. After a 10 year career as a trend researcher and photo editor, she not only has a keen eye but has a particular interest in staying abreast of new trends in the outdoor living and horticultural industries, including; design, materials and new plant introductions. Living in several metro areas on the West Coast, including - Vancouver BC, Seattle, the Bay Area, Santa Barbara and Los Angeles, she can't help but be drawn to all things "West Coast style". Kim Rooney landscape architecture is a boutique design office that specializes in custom residential landscapes. We take great pleasure and pride in our work and truly enjoy creating special and unique outdoor environments. One of our goals is not only to help you enhance the value of your property, but also to enhance your lifestyle by creating outdoor spaces that invite you to spend more time outdoors. At KRLA are inspired by nature, architecture and our clients. We hope you enjoy looking through our work here on houzz and feel inspired to contact us for our next project. With over twenty years of experience in the industry, Kim Rooney landscape architecture offers thoughtful, creative, and sustainable design solutions for the outdoor rooms and exterior spaces of your home. We are a full service landscape architecture office. Services include design of your landscape from concept plans through construction drawings, bid procurement, assistance in contractor selection, as well as, construction observation and management. As your project is built we work along side of the contractor to ensure the design intentions are met and that your project is installed with the highest attention to detail possible. Kim's design work has been recognized for projects in Seattle, Chicago and Canada. Awarded by ASLA, ILASLA, CAASLA, and Northwest Design Competitions. 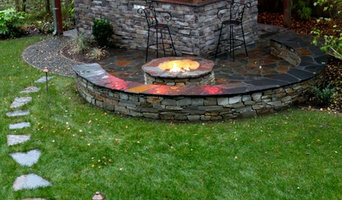 Lifestyle Landscapes is a custom residential design/build firm located in Seattle. Our landscape designers and our installation team create beautiful outdoor spaces that are inviting, unique and environmentally sound. Our award winning team would love to enhance your lifestyle by bringing the beauty of the Pacific Northwest home. When homeowners Roger and Peggy Franklin decided to hire a professional landscaper they were disenchanted with the level of service they received from prospective landscape design and installation companies. “We were prepared to make a serious investment in our outdoor living space and we couldn’t even get landscaping companies to return our call,” remembers Peggy. As experienced entrepreneurs, Roger and Peggy quickly recognized the need for a landscape design and installation firm that provided quality landscaping services to discerning homeowners throughout the Puget Sound. They decided to establish a landscaping organization that exceeded the expectations of the client, enhanced the client’s lifestyle and increased the client’s home value. 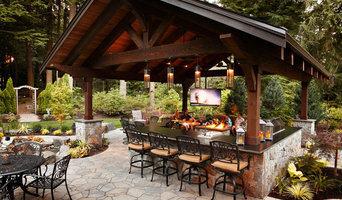 They assembled a team of highly skilled landscape and business professionals and created the Lifestyle Landscape’s organization based on proven business principles A core reason our company enjoys its hard-earned reputation for designing and installing exceptional outdoor living spaces for Puget Sound homeowners is the skill and experience of our team of professionals. Many of our team members have been with Lifestyle Landscapes for more than a decade, working together to exceed their customers’ expectations. The members of our team are introduced here. Folia Horticultural Design is a full service landscape design/build firm based in Seattle, Washington. With over 30 years experience in the field, Peter Norris, President of Folia Horticultural Designs has created hundreds of inspiring gardens and interior scapes. Staffed by landscape designers and certified horticulturists, our team works directly with Mr. Norris, to assure each client a personalized design that will complement the architecture of the residence or commercial space. Each design incorporates hardy plants and durable hardscape elements selected for the rigors of our precipitous northwest climate. Founded by Peter and Elise Norris, and specializing in interior and exterior living environments. How you live inside is how you live outside. The work of this outdoor professional includes most everything surrounding a home's exterior. A landscaping architect can even work with the home architect to choose the right spot for your South Hill, WA house. From there the South Hill landscaper will develop preliminary concepts for your front or backyard design based on individual needs including the climate and activities that will take place, as well as layouts and planting plans. Landscape architects will also design any structures or outbuildings that will be added to the space. Any grading changes that will be added to the yard are also the responsibility of the architect. This includes any drainage modifications. An engineer can also be responsible for these tasks, but licensed Washington landscapers are fully capable. Like building architects, they will produce preliminary concept drawings as well as detailed construction documents and planting plans. Three-dimensional renderings and illustrative plans are all supplementary. A South Hill landscaping designer generally will have ecological, aesthetic and technical training, which helps them maximize the potential of your outdoor space. Keeping in mind both style and functionality, garden designers analyze your architecture and yard to produce a plan that may or may not include location and materials for walkways, patios, water features, fences, garden aspects and more. In addition, a landscaper in South Hill, WA will carefully assess your geographic region to choose plants, trees and flowers that will flourish naturally, as well as address concerns such as drainage, screening and soil conditions. Certain landscape designers only help with the planning portion, while some may deliver the plans and then oversee a hired landscaping contractor. Others — typically following a design-build approach — take care of both the design and all aspects of the landscape architecture and construction. Before you hire a Washington professional landscaper, consider the scope and emphasis of your outdoor project. Landscape architects, who typically hold advanced degrees in their field, are trained to develop comprehensive structural plans that include plants, hardscaping, water use, drainage and more. Landscape designers typically specialize in the aesthetic and horticultural, rather than structural, side of yard and garden planning. They might or might not have advanced training. Even within their fields, a garden designer may specialize in hardscape- or vegetation-focused designs. In some cases you might need to hire additional help to get the outdoor space you want. Here are some related professionals and vendors to complement the work of landscape architects & landscape designers: Landscape Contractors, Garden & Landscape Supplies, Tree Services, Gardeners, Lawn Care & Sprinklers, Decks, Patios & Outdoor Enclosures. Find a South Hill landscape architect on Houzz. 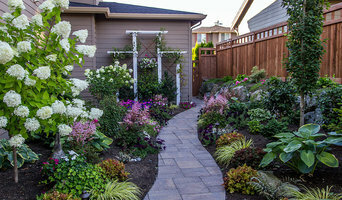 Narrow your search in the Professionals section of the website to South Hill, WA landscape architects and designers. You can also look through South Hill, WA photos to find a space you like, then contact the professional who posted the photo.